As the Brexit debate reached crisis point this week pro-Europeans took action to lobby for a campaign on a further people’s vote. Simon van der Slikke, a member of the European Movement (EM) 1066 Branch, organised a meeting at Robertsbridge Village Hall on Saturday, January 12. More are planned in Rye and elsewhere in East Sussex. EM is a cross-party organisation committed to keeping the UK in the EU. 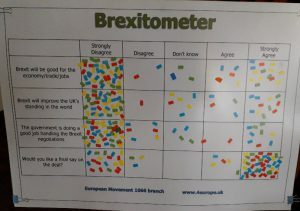 The idea is to gather more local views and pass them on to the media and MPs, hold action days and counter the propaganda (which the group regards as false) of the leave campaign. 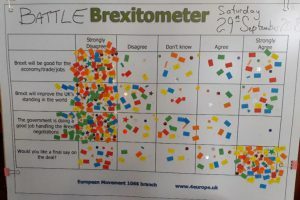 The EM1066 Branch was set up to give people in the Bexhill/Battle and Hastings/Rye constituencies the chance to come together at a local level with the opportunity to discuss a campaign for a people’s vote on the final Brexit. The aim of EM is to push for voters to take back control to break what they see as the present paralysis of government and opposition not only due to internal dissent, but also by their putting party interest before the welfare of the country. Speaking to people in the street, members of EM have come to the conclusion that the mood in the country has changed since 2016 and now more people want to remain, having been more informed about the consequences of Brexit, especially of crashing out without a deal. Jonathan Kent, a member of the Bexhill/Battle branch of the Green Party started off the discussion. He felt that the Brexit vote had a lot to do with kicking against the establishment by the people who felt forgotten or disconnected and left behind. He suggested that until everyone can have equal hope, opportunities and aspirations and not be caught up in a divisive economy, there will always be a divided nation. EM set up a working group to choose about 14 questions from the many sent in by members to put to Rye MP Amber Rudd. The audience was told that she said it was refreshing having an open discussion on the Brexit issue rather than the constant pressure from single-minded Brexiteers. However, Amber Rudd kept to the party line and the working group felt that, like many other MPs, their opinions will be kept under wraps until after the this week’s voting. Amber Rudd did campaign to remain but was clear that it was important not to deny the democratic process leading to the leave vote. From the questions and answers it could be deduced that the audience was mostly in favour of EM’s aims and that they felt a ‘no deal’ would be the most damaging of all. As there is fear of unrest should another referendum be put in place to stop Brexit it was suggested that the government come up with different solutions to be considered. It was also suggested from the floor that if Labour leader Jeremy Corbyn should get a chance to propose a new deal, the 27 EU member countries would need to agree again, which is unlikely to happen, although the European Court of Justice has indicated that article 50 could be cancelled without their agreement. The general consensus at the meeting was that the current contradictions and government’s disastrous path started with a people’s vote and needs to end with a people’s vote. Editor’s note: Since our correspondent wrote this article the Government was defeated in a vote on the deal it had negotiated but won a subsequent no-confidence vote. Following this, the Prime Minister is having talks with other parties and individual groups to try to arrive at a consensus for the next move. The only party currently refusing this invitation is the Labour Party which requires guarantees of no “no-deal” Brexit, no backstop and a commitment to continue to have market access, EU employee rights and protection, and to remain in the customs union. The “no-deal” Brexit and the backstop demands may possibly turn out to be negotiable but it seems unlikely that the Prime Minister could agree to the customs union as this would result in continued control over many aspects of UK trade and law, without the ability to have our voice heard in the EU Parliament. This would be an anathema to many in her party and is precisely what 52% of the country, rightly or wrongly, voted against. A new version of the Brexit deal is due to be voted on by Parliament on January 29 although in the meantime Labour leader Jeremy Corbyn is continuing to threaten further no-confidence votes and demanding a general election. At this moment, however, there is no reason to believe that the outcome of a no-confidence would be any different to the last one and certainly no chance of the government willingly offering a general election. It must be remembered, of course, that whatever deal the government comes up with, also has to be agreed by the EU 27 and, at the moment, despite some recent conciliatory words from German Chancellor Angela Merkel, they are still playing hardball. I am of the opinion that if we are unable to re-negotiate the existing Brexit Agreement with the EU (which I believe is very unlikely) and if Plan B does not meet with the agreement of Parliament (also unlikely being there are so many factions putting forward conflicting propositions), the Government should ignore the siren voices of those calling for a second referendum. If democracy means anything such a move would be an abject betrayal of what the people voted for in 2016. The only alternative seems to me is to leave without a deal on the 29th March. This country has been through worse times in its recent history and survived. I strongly believe we could shoulder the immediate difficulties post Brexit, and build new trade relationships with the rest of the world to our benefit. The EU is doomed having signs already of having some very serious economic difficulties mainly arisen from its policy of clinging to the euro and the inability to control immigration. Do we want to remain on this sinking ship is a question we should be asking ourselves?